One of the selling points of G Suite Business against Microsoft Office 365 is continuous improvement in all areas. At Google’s annual conference, Google Next, Google released a number of features and functionality for G Suite which make it clear that Google is going after enterprise-level clients. However, if you aren’t quite the size of Verizon yet (which recently adopted G Suite) there’s still lots of goodies to unpack for your business. 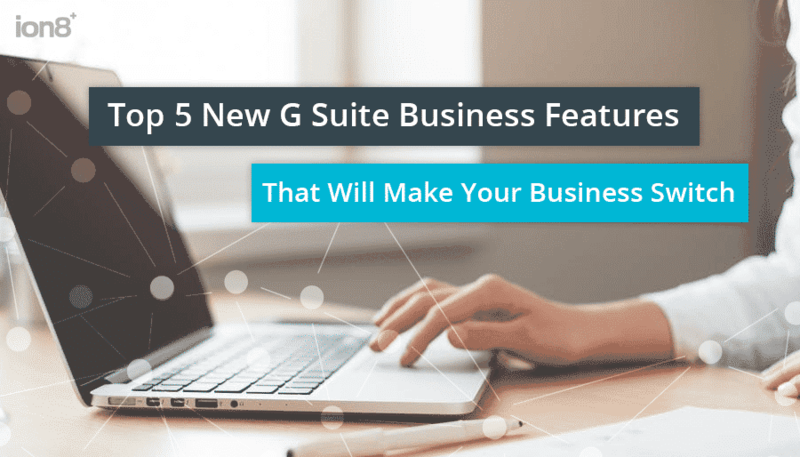 We asked Fausto Rodriguez, one of our resident Google experts, what the top five features are for G Suite business clients. This is really the biggest advancement in G Suite and the one that will have the most immediate impact on productivity in your organization. Remember back in the day when each department had its own server, or its own space on the company server? Team Drives bring this lost experience back for a new generation. Now, when your team logs on, they will see their department files in their own Team Drive first. Additionally, through Google’s rapidly advancing machine learning technology, they will see the files they use most often. When a Team Drive file is created, the file’s owner is the team, not the individual user – making it easy if an employee suddenly transitions out of the organization. This new feature frees up local hard drive space by streaming files directly from Google Drive, rather than syncing everything to a local machine. If you want to download files you still can, but there is no local syncing process which takes up hard drive space. This feature was arguably put in place to soothe the fears of early cloud technology adopters, who wanted a local copy of a file “just in case”. This isn’t necessary anymore since mostly everyone trusts that the file will live permanently in the cloud. Google Vault is moving further into its role as a tool for enterprise-class eDiscovery and file retention rather than a backup tool. Google Vault has traditionally helped businesses which must deal with compliance rules and regulations on data security and privacy, and this new innovation makes Google Vault even better for that purpose. You can now set retention policies for your new Team Drives, files on Google Drive, and Google Groups. Different organizational teams can now have different retention policies, allowing admins to choose to pay special attention to the departments which need it. You can also export all files, including emails, from a specific point in time, which makes eDiscovery a breeze. Google Meet is the new Google Hangouts for business. It allows easy, plugin and download-free access for 30 people in each conference without the need for attendees to have a Google account. This puts it miles ahead of services like GoToMeeting or JoinMe which you may have previously been using in your business, so cancel your subscriptions – Google Meet is included with the price you pay for G Suite. You can set up virtual chat rooms for each team or project which are fully integrated with the rest of G Suite and fully searchable. One of the big things we do at ion8 is make sure your software integrates with other solutions, and Gmail is a very common tool businesses want to use this integration for. Gmail works better if it is talking to your Customer Relationship Management solution, project management package, accounting software, and any other packages you use where you may want to capture emails from clients. Right now, the integration interface is a little clunky. Google is cleaning it up by adding each integrated solution as a card on a sidebar in your Gmail, and you can choose which cards display and which don’t. While it may seem like a small thing, this will clean up the user experience for your employees and ensure that they can get to what they need quickly and easily. These improvements and features are by no means all that Google rolled out – there were over 100 announcements made at 2017’s Google Next conference. If you would like to find out if any new features have finally made G Suite right for your business, contact ion8 today.